New York's newest luxury lifestyle development succeeds as a mall, but is that enough for it to be successful? Last week, the Shops & Restaurants at Hudson Yards, a seven-story complex that offers nearly 1 million square feet of retail space within the new Hudson Yards megadevelopment, opened to the public in New York City. PSFK researchers went to see if this retail playground built on top of a railyard in the city’s far West Side measured up to the hype. As a retail space, the Shops & Restaurants at Hudson Yards is dazzling; entering it feels like stepping into a glamorous megamall in Shanghai or Dubai. While it succeeds as a mall, will that be enough for it to succeed in today’s competitive retail environment? The roster of shops contains many of the usual suspects, such as Zara, Uniqlo and H&M, but it is unclear whether these shops will serve as enough of a draw, considering that each of these retailers has flagship spaces elsewhere in the city. As consumers increasingly want their favored brands to be a part of their everyday lives, what will compel shoppers to come to this location, which is relatively cut off from the rest of the city, when they could just pop into one of the retailer’s other stores on Fifth Avenue or SoHo as they go about their days? Whether these retailers will offer exclusive experiences that shoppers can only get at Hudson Yards and not at their other locations throughout the city remains to be seen. 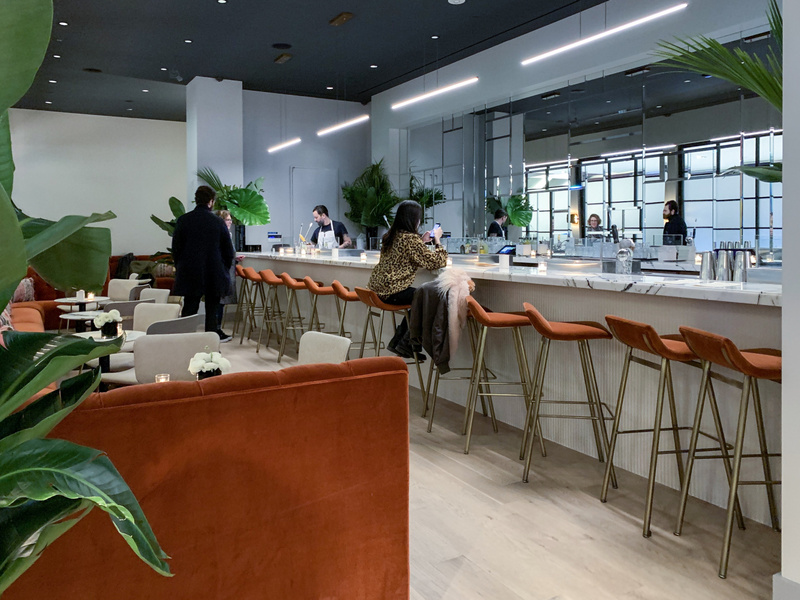 One area where the Shops & Restaurants at Hudson Yards stands out is in its curation of digitally native brands in a bid to appeal to younger shoppers, offering items that can’t be found elsewhere in the city–or anywhere else. Its ‘Floor of Discovery’ on the second floor puts a spotlight on emerging DTC brands, such as Mack Weldon and Stance, giving many of them their first permanent physical retail presence. Because consumers can buy anything they want online, they increasingly look to the physical store as a means to engage with their favorite brands, so it is surprising that many of these stores seem very traditional in their layout and merchandising. Perhaps in the coming months, these DTC brands will fully leverage the physical store as an opportunity to educate and connect with their community in a way that they cannot do online. Anchor tenant Neiman Marcus has created a beautifully laid out store that offers shoppers some additional value-added services, such as a denim customization bar, a beauty salon, arcade games and a digital styling lounge where shoppers can meet with a stylist and browse styles found only online. However, it remains to be proven if this will be enough for this Dallas-based retailer to stand out in New York’s already crowded luxury retail landscape and draw shoppers from the city’s iconic department stores and flagships, who are currently revitalizing their store experiences. While the exhibition space Snark Park and an art installation called HYxOffTheWall provide plenty of social media-friendly backdrops and 3DEN provides a spa space for relaxing (for a fee), there is little in the way of gathering spaces, or even spaces to sit. The lack of community space stands out, as other malls are currently striving to reinvent themselves as modern town halls, almost as if the experience was meant to be something broadcast to friends on social media rather than enjoyed together in person. Although the Shops & Restaurants at Hudson Yards offers a very pleasant, even luxurious, shopping experience, much of it seems geared towards tourists or the future residents of Hudson Yards, and it remains to be seen whether it will be a draw for New Yorkers at large, given their general aversion to anything resembling a suburban shopping mall. Overall, many aspects of the Hudson Yards experience already seem as though they were conceived in an earlier era of retail, bypassing many of the current trends that PSFK is seeing happening elsewhere in New York retail, as brands are using their physical spaces as marketing vehicles to share their brand stories and create immersive experiences that surprise and delight. When presented with the ultimate blank slate—a previously undeveloped section of Manhattan—it’s surprising that the developers chose to create something in the mold of a traditional mall, instead of seizing the opportunity to create an entirely new and inspiring retail experience. 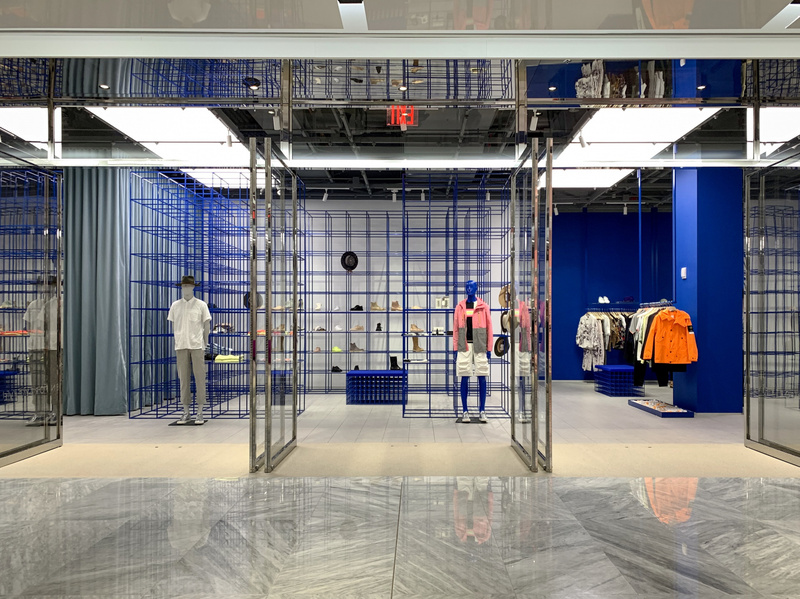 This luxury boutique retailer from Dallas, Texas, has opened a 16,000-square-foot, multi-section store that merges fashion with art, thanks to bold, gallery-like spaces designed by architecture firm Snarkitecture (which also designed the Snark Park). The boutique offers cutting-edge designer wares for women, men and the home, with an expertly curated selection of emerging designers and vintage goods. Artwork and installations throughout the spaces create an immersive shopping experience. Iris Nova, the parent company of direct-to-consumer beverage brand Dirty Lemon, has opened a beautifully designed cocktail bar experience featuring alcohol-free mixed drinks with inventive ingredients, such as yuzu and wasabi, alongside a cashierless vending store that uses RFID-enabled refrigerators that track inventory sold and QR codes that prompt shoppers to pay via text message. Peach Mart is chef and food entrepreneur David Chang’s homage to Asian convenience stores, featuring packaged snacks, such as Hi-Chews and Pocky, and kimbap (Korean rice rolls), along with other assorted sundries. Next door is Kāwi, Chang’s fine dining restaurant featuring Korean food from Executive Chef Eunjo “Jo” Park. Snark Park is an immersive exhibition space designed by New York architecture firm Snarkitecture featuring a rotating series of installations that serve as the perfect social media backdrop, such as a two-way mirrored room and a giant claw vending machine. A counter at the entrance sells custom merchandise, along with sweet treats from KITH, a cult streetwear brand known for its in-store cereal bars. 3DEN is a pay-by-the-hour coworking/spa concept designed to serve as a third space, a welcoming place where shoppers can pop in for a quick relaxation break. 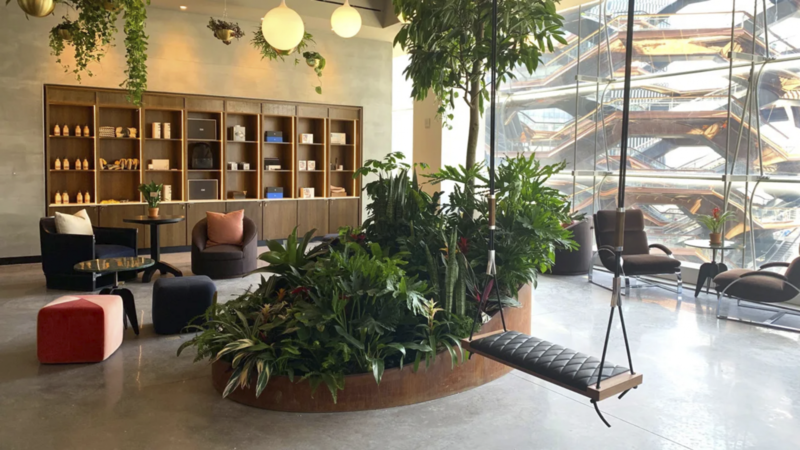 The nature-infused space features comfy nooks for relaxing, a meditation space, phone booths, showers and Casper nap pods. M.Gemi’s Hudson Yards location is the direct-to-consumer luxury Italian shoe brand’s first permanent retail space. Its design concept was inspired by contemporary Italian cafés, and the space features a coffee bar to encourage shoppers to come in and relax with an espresso—or prosecco. Shoppers can book a VIP appointment ahead of time through Resy for a high-touch shopping experience. 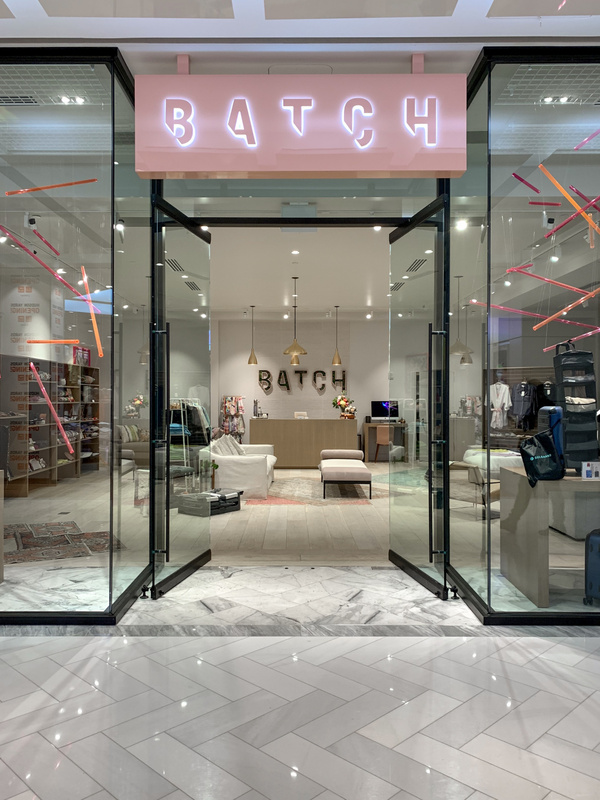 Batch is a San Francisco-based home and lifestyle retailer that offers a rotating selection of up-and-coming brands in a setting that is designed to feel as welcoming as a home. The inaugural collection is called ‘Batch Hello’ and serves as an introduction to Batch’s favorite finds across the categories of beauty, apparel, pet, art and more. b8ta lets shoppers see, play with, and buy some of the world’s newest and most innovative tech products within a physical retail environment. Featuring products from cutting-edge tech startups, b8ta invites customers to demo and play with innovative gadgets from mostly online, hard-to reach brands, with on-staff associates available to answer questions. B8ta has a store located inside Macy’s in nearby Herald Square, but the Hudson Yards location is its first standalone store in New York City.